DIKANDA is a music band of international renown, playing "world music". They come from Szczecin, Poland. In their artistic work DIKANDA promotes the authenticity of style – searching for new trends therefore most of their works are original compositions. 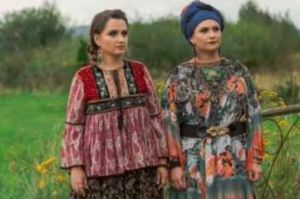 They draw their musical inspiration from traditional folk sounds of the broadly defined Orient – from the Balkans, through Israel, Kurdistan, Belarus to India. Their works are dominated by the Balkan and Gypsy influences. The band has been playing since 1997 and has recorded 7 albums so far, including a Live DVD recorded in the Witkacy Theatre in Zakopane. They have performed hundreds of concerts, mostly in Germany, Austria and Switzerland but also in Russia, India and the USA. They have won numerous awards – among others in 2005 their album "Ushtijo" was awarded "The Disc of the Year" by a German magazine "Folker". DIKANDA's concerts are extremely emotional journeys through ethnic sounds, zestful meetings full of charisma, energy and true feelings. What sets DIKANDA apart is creating new words in their lyrics, thus forming their genuine language - "dikandish". The most important element of their artistic work is the message – a special relation between the musicians and the audience. Ethnofield - Dikanda online store. Christmas is slowly approaching. We spend the time of preparations for Christmas in a recording studio in Częstochowa. We hope, soon, to present you some Christmas carols in our Dikanda's arrangements. We invite you to our Christmas concerts in January and February. Meanwhile - Merry Christmas! Soon, the premiere of our new video clip. Do you think that we are idle? Not at all! Soon the premiere of our new music video. And in March we will be playing 11 concerts. See you! Devla Devla, 2017 - NEW! 3. Africa Zina - lyrics: trad., music: trad. 8. Kis kece lanyom - music: trad.